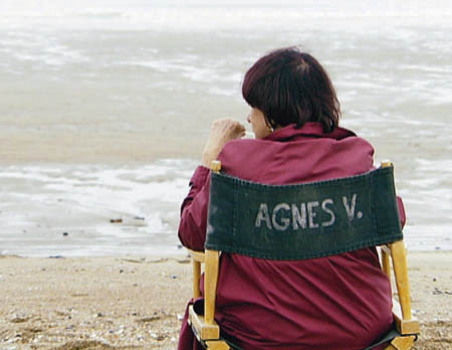 Eternally feminine and forever a feminist, French director Agnes Varda is loved and honored at home as the 81-year-old grandmother of New Wave cinema. Luckily for those too young to know about that groundbreaking movement of the Sixties, she is also a great collector of props and people and, yes, beaches. She loves boats. She loves art. She loves photography. She didn’t start making films until she dared to make one about her own hometown of Sète in her mid-twenties, a precursor of New Wave directors like Truffaut, Godard, Resnais and her husband Jacques Demy. “I’m playing the role of the little old lady, pleasantly plump and talkative, telling her life story,” she begins, disarmingly. But this little old lady is a great visual artist, so Beaches of Agnes is full of images and grace. There are words, but she is more interested in getting us to “see deeply” as she puts it. “I don’t want to show things, but to give people the desire to see.” This is a love letter to her life and to her family and friends, and a it’s privilege for us to share. Her movie is a kind of visual scrapbook in which she digs out a succession of sepia photos, fragments, reels, relics, haunting images, tapes, and art installations from the past, mainly about her favorite beaches, waves, sailing, places she lived and worked – and also about her “Patatutopia” entry to the Venice Biennale, starring her in a potato costume with her potato photos and seven hundred kilos of potatoes. Constantly at play, her artist’s eye frames a series of artful images – a few mirrors opposite a turbulent sea bring breakers, surfboards, waves, sails into focus: a reverie in blues and grays. As much a photographer and artist as a filmmaker – she saw only a handful of movies growing up – she creates art out of her surroundings ceaselessly. The results are deceptively simple and full of color. Trapeze artists swing against the sea in Sète where she lived and sailed as a child and where she made her first movie, La Pointe Courte. In Paris she sails past quays where she once strolled as an art student. She retouches photos of Rodin sculptures, she photographs actors at the Palace of Popes in Avignon, she visits China and Cuba and California at interesting times, always with her camera in hand. But it is other people who intrigue her, she says: the Bohemian friends that people her early movies, Cleo from 5 to 7, Vagabond and One Sings, The Other Doesn’t. She includes the great stars of French national theater, plus sculptor Alexander Calder, a very young Catherine Deneuve and Jane Birkin, Harrison Ford on an abortive film test, and Gérard Depardieu as a predatory beatnik. Avant-garde director Chris Marker appears as a cat image complete with a growl. Other New Wave auteurs like Alain Resnais and Jean-Luc Godard were also associates, but unlike them she did not start filmmaking as a critic. Her director husband Jacques Demy of The Umbrellas of Cherbourg is lovingly recalled; they worked together, and she made a film account of his early life, Jacquot of Nantes. Pictures of them working side by side in their converted windmill on an offshore island, with or without their children, show a couple united in calm creativity. “Any man who gazes at the sea is Ulysses, a Ulysses who doesn’t always want to come home,” she says. Her films arrived sporadically between other art projects. Although some – Cleo From 5 to 7 and Le Bonheur in particular – were commercial hits, a segment about filming on location shows her juggling the many roles of director, and the financial headaches seem irksome. Perhaps this is one reason why she did not film more. Working with her husband on his films and her preference for images to narrative may also have counted, along with their long hiatus in Southern California. In the background on her soundtrack, as driven and as arresting as breakers in the sea, she has chosen Schubert’s Unfinished 8th Symphony. It seems appropriate – still not finished, we hope, Madame Varda?